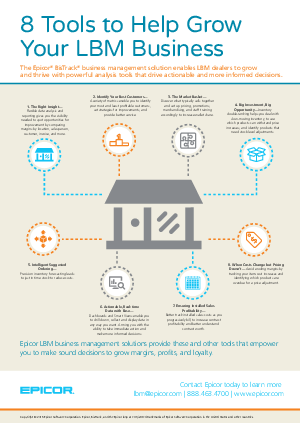 Collecting actionable insight is key to making informed decisions about your LBM business. Epicor BisTrack provides eight LBM analysis tools that enable LBM dealers to grow and thrive, including flexible data analysis and reporting, customer stratification, and actionable, real-time data. Download the Tip Sheet to learn how else Epicor BisTrack can empower you to make sound decisions to grow margins, profits, and loyalty.